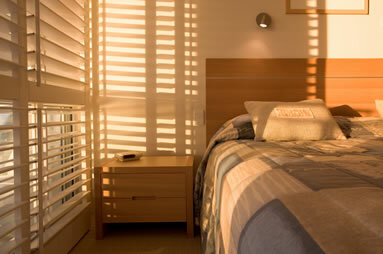 Accurate measuring is the most important step when buying plantation shutters. It is for this reason that it also causes the most anxiety. Most windows are relatively straightforward to measure for plantation shutters so if you can read a tape measure and you can follow the instructions on this site, you shouldn’t have any problems. Remember to contact us if there is something you’re not sure about and we’ll be happy to help you. Plantation shutters are custom made exactly to your requirements and it’s to no ones advantage if they don’t fit properly – so don’t hesitate to give us a call. Make a 4-5mm deduction on your opening width and 2-3mm from your height to allow frame to fit within recess. The main pitfalls to look out for when measuring for plantation shutters are obstacles that may prevent the shutter frame from fitting properly or protruding objects such as handles or alarm boxes interfering with the louvres. You are likely to encounter these when mounting your shutters inside the reveal using the L frame. Also check if any of your windows open or tilt inwards. This will prevent an inside mount meaning the shutter frame will need to be fixed to the face of your wall using the outside mount Camber Deco frame. Remember to add the frame width x 2 (134mm) to your opening width and 67mm to your opening height if yours is a three-sided frame. Order your FREE colour samples to match up with your interior decor. If you need any help or advice when measuring, please call us on UK 028 9099 5904. Send us pictures of your windows also as this can be helpful to us if you’re not sure exactly where to measure from.